The original name of this beach prior to the arrival of the 1820 Settlers was The Fishery. The probable reason for this name was that in 1817, the entrepreneur, Frederick Korsten, had established his whaling and sealing business in a cove, or small sheltered bay, near the Shark River mouth which was close to Shark Rock or Hobie Beach. The name Shark River is a corruption of the Afrikaans version of this river’s name: Sak Rivier [or Sinking River] as the water disappeared as soon as it reached the beach. With the Englishman’s penchant for unilingualism, the river was accorded the name Shark River. In those days, the Fisheries was isolated from Port Elizabeth. To the south west were the shifting driftsands bringing sand all the way from Gulchways, between Schoenmakerskop and Sardinia Bay, and to the north was an impassable rocky coast, unsuited to wagons of any descriptions. The westerly winds brought with it, choking clouds of sand which were deposited on the beach and into the sea at the Fisheries. 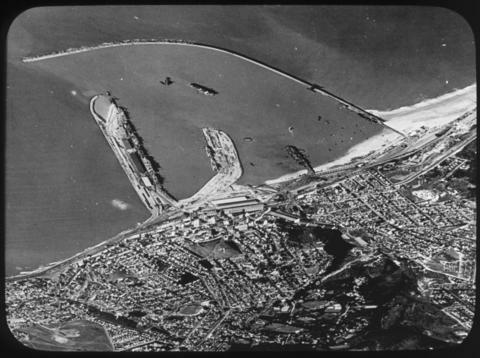 This constant resupply of sand ensured that all the sand carried northward in the current swirling anti-clockwise around the bay, was immediately replenished. The track between the Fisheries and the centre of Port Elizabeth was by means of an inland route to Paapenbietjiesfontein, which lay south of Walmer Road and stretched as far as the Shark River. In those days, between late June to early July each year, a large number of whales migrated to the sheltered bays along the coast of southern Africa to calve, nurture their young and then mate before leaving the bay and returning to their feeding grounds. The most sought-after whale was the Southern Right, so named because it was the right whale to hunt, being slow-moving and easy to catch, and, unlike other whales, it floated after being killed. In the early days of the port, a number of harpoonists made a name for themselves. Foremost amongst them was a Portuguese whaler, Jose de Mell, a fearless and accurate man employed at the Fishery. 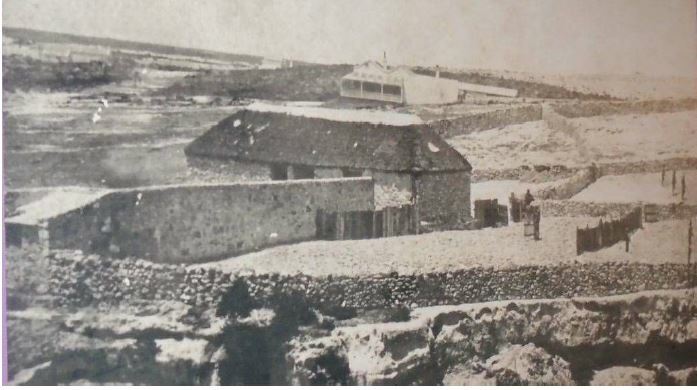 One wonders where this dwelling house was located taking into account the fact that the whalers only launched their whaling boats when they saw the whales blowing in the Bay. Could it have been Brookes’ Hill or the hill on the opposite bank of the Shark River behind the Town Lodge? Whaling along the eastern Cape coast was no longer a paying proposition with men looking towards the islands closer to Antarctica to make a living. It was probably at this time that the whaling station was abandoned as it coincided with another event which will be discussed below. Every year the notorious south easter would drive ships onto the North End beach. The reason for this was that the sailing vessels would anchor in the roadstead off the landing beach. The gusting winds would snap the ships’ anchor ropes and then drive the ships in a westerly direction towards the northern beaches. As a consequence, the southern beaches were hardly ever the recipient of beached vessels. But it did happen on occasion. Enumerated below are the only incidents in which vessels were stranded on the southern beaches and ironically in all three cases, they washed up at or near the Fisheries. 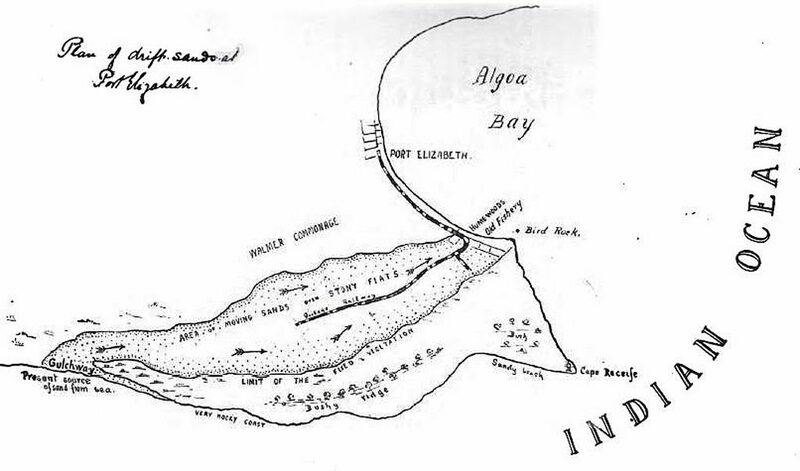 The first incident was in December 1842 when the brig, the George IV, beached near the Fisheries, while attempting to work her way out of the Bay. Men of the 91st Regiment were called out to assist with the unloading in order to lighten her. She was refloated the next day. The lack of damage probably reflects that fact that the beach prior to the planting of vegetation on the driftsands, ensured a plentiful supply of sand for the beach. According to Urquhart in 1873, “the ‘Hotbank’, under command of Capt. James Binet, and carrying a cargo of coal and iron, sailed into the Bay after a journey of 130 days out of London. Binet, with pilot Paterson aboard, reported striking an ‘unknown object’ while rounding Cape Recife. Leaking badly, the brig, dropped anchor and Paterson rowed ashore to arrange for repairs. When he returned with Messrs Searle, Haynes, Oliver and several others, they discovered that all aboard had deserted the ship fearing that she was about to sink. After an inspection, it was decided to beach her near the Fisheries. The final vessel to be beached at the Fisheries was the coasting schooner, Bilsby, of a local merchant, Henry Bailey Christian. In September 1875, she was driven onto the beach at the Fishery during a south-easter. The fully laden, uninsured vessel was carrying a cargo of potatoes, mielies and hides from East London. Capt. Turner and his seven-man crew and passenger Venn landed safely. 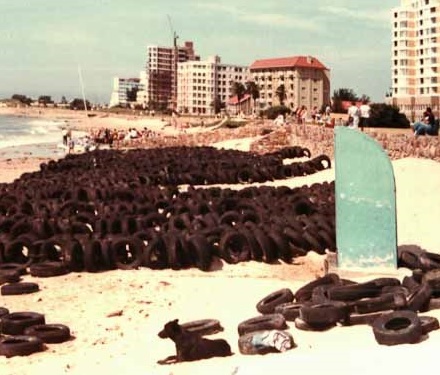 In its early years, Port Elizabeth possessed a unique feature which has largely been destroyed due to mis-diagnosis of the problem. Stretching from the Sardinia Bay / Glutchways area, across Bushy Park, south of the Walmer commonage, across the present-day airport, over the Shark River to the Fisheries, was a swath of drifting sand dunes. By the 1870s, these sands had buried the buildings of the whaling station situated at the Fisheries. In 1893, a small steam railway line was laid extending out past Humewood and over the Shark River. At the Fisheries, this branch line veered south west and proceeded in the middle of this line of dunes probably no further than Victoria Drive, close to Schoenmakerskop. I strenuously contend that these sand dunes should never have been removed as they did not pose a threat to Port Elizabeth. I base my contention on the fact that they had been in existence for eons and yet the harbour area had never been engulfed by its swirling sands. Instead it was a stable eco-system which has now been dismantled. 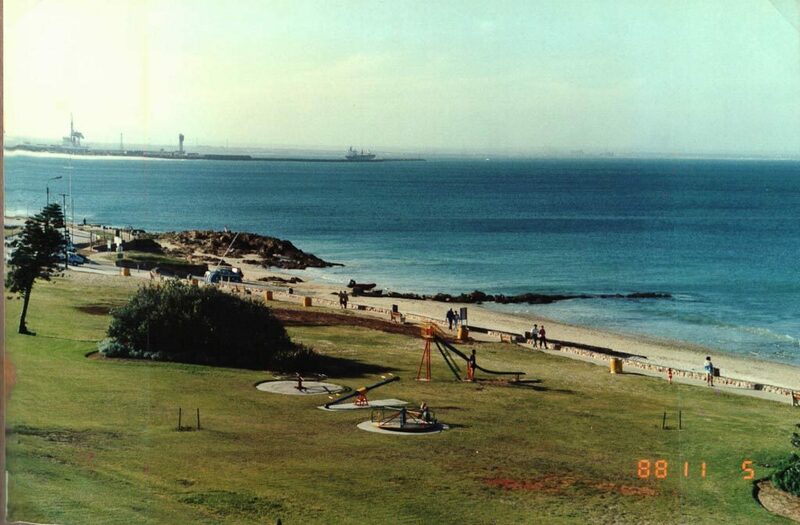 As the sand on the northern beaches is no longer being replenished by this natural conveyor system, Port Elizabeth will be compelled to pump sand from King’s Beach to the beaches further south some time in the future. As I have previously written extensively on the other activities at the Fisheries and adjacent areas, I will just briefly touch on these activities. Note that all of these activities were undertaken when Humewood did not exist and there was only an inland rutted track from Shark River to the highest point of South End. As Frame owned the land in the Shark River, he first established a woolwashery close to the mouth of the river but later on, he was involved in the construction of Port Elizabeth’s first dam which was located on the Shark River. This dam still exists today, but due by some inexplicable fluke, it survived the floods of 1968 which swept away the Shark River bridge and the restaurant on the northern bank. 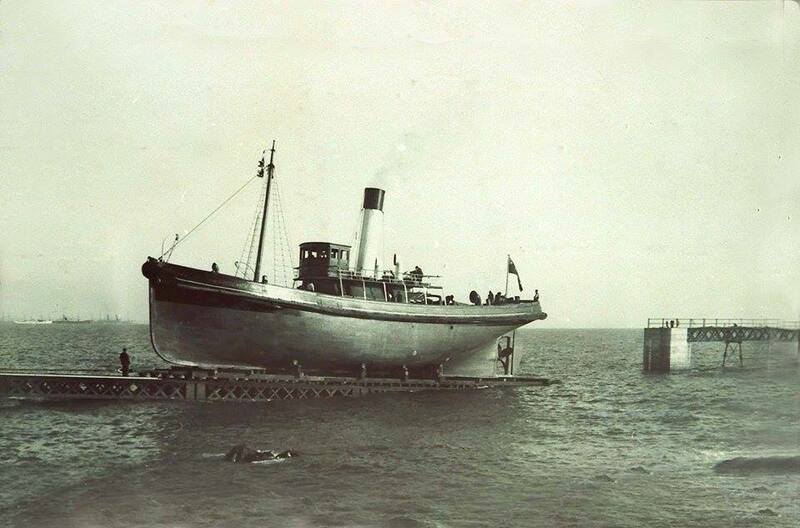 On the 10th March 1902, the first vessel to be constructed on the slipway at the Fisheries was launched. It was Mary, a steel lighter for the Harbour Board. The first of a new design, it was ordered by James Searle from Allan and McLennan in Glasgow. The parts were shipped to Port Elizabeth and assembled on the slipway by Scots’ boat builders. While the exact boundaries of the Fisheries cannot be ascertained but, in all probability, it encompassed part of Humewood Beach as well as Shark Rock Beach. Supporting this supposition is the fact that once the suburb of Humewood was proclaimed, portion of the Fisheries was now known as Humewood, whereupon the residue of the Fisheries now came to be called Shark Rock Beach. 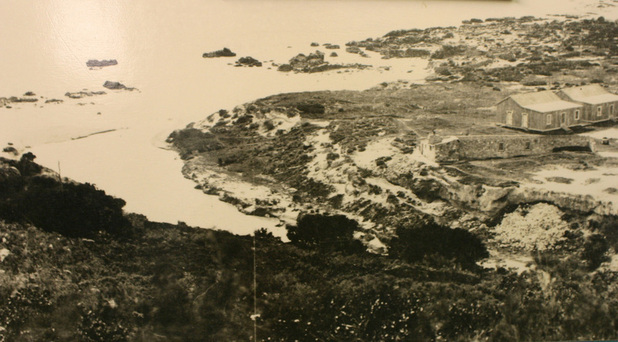 As early aerial photographs of the Harbour and King’s Beach will attest, King’s Beach was extremely narrow. But over time with a steady accumulation of sand against the breakwater, it now extends the whole length of the wall. Furthermore, earlier photographs of the coastline, taken in the 1800s from Donkin Reserve, show huge sand dunes in the south east. With the stabilisation of these dunes by planting bushes and shrubs on them, the beaches south east of Humewood were steadily denuded as the sand was scoured out and swept to the harbour wall. 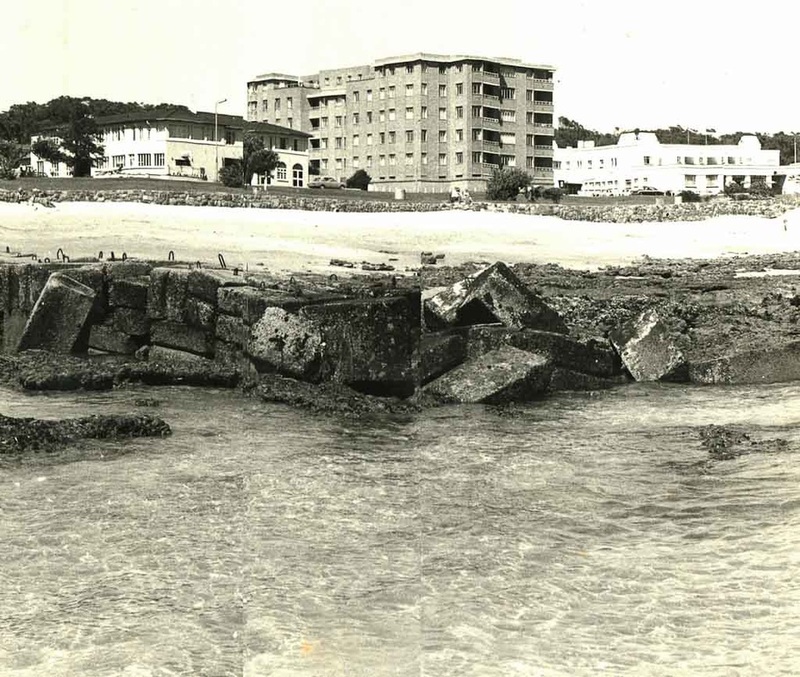 Initially Shark Rock Beach was not affected as it was drawing its replenishment from Pollok Beach. 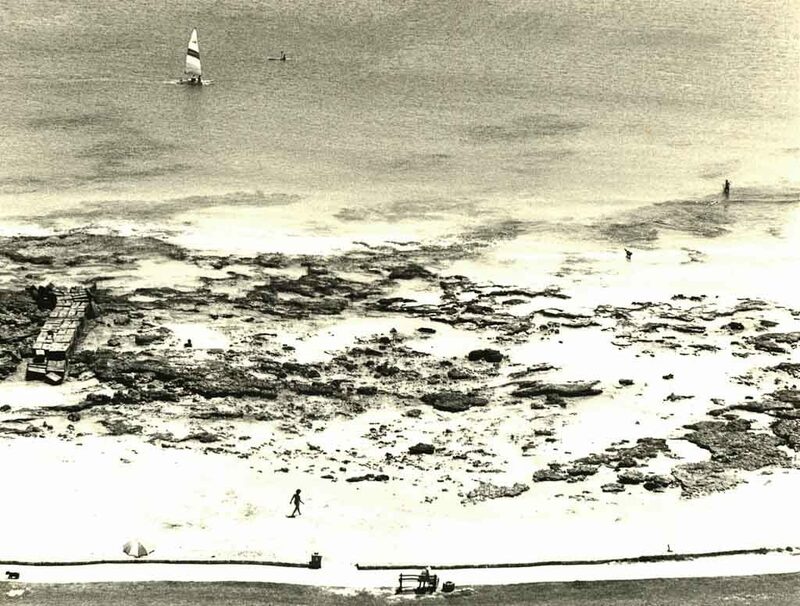 It was only when this supply dwindled that Shark Rock Beach itself showed signs of losing its youth as it steadily became a rocky beach. 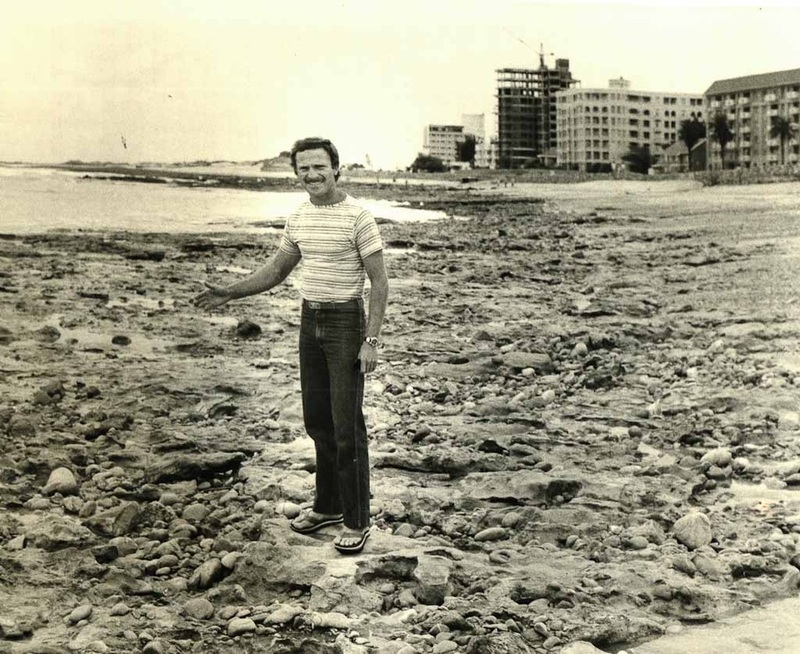 According to Peter Schwartz in his article on the ‘History of Hobie Beach’, “Development along this stretch of beach started in 1976, with the construction of Katie’s Walk, which is the pathway built along the shore in this area, and still stands today, as the walkway running in front of Barney’s all along the beachfront up to Pipe. 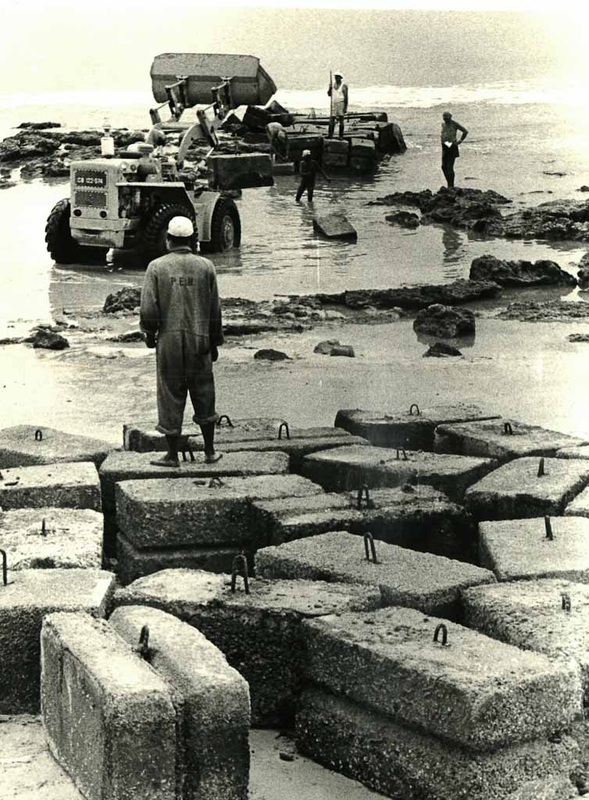 Part of building the walkway was the construction of the wall along the shoreline. This had the effect of destroying the small sand dunes that used to replenish the adjacent beaches. So what happened was all of a sudden, rocks started to appear on the beach because the sand wasn’t now getting fed back onto the beach from the dunes”. In my opinion, this was a minor attributing factor as the major source of replenishing sand originally arose from the vast dune fields stretching inland from Fisheries / Shark Rock Beach. Peter Schwartz continues that “This led the municipality to recommend [that] Hobie became a boating, not a bathing beach”. It must have been at this juncture that the sobriquet Hobie Beach arose. 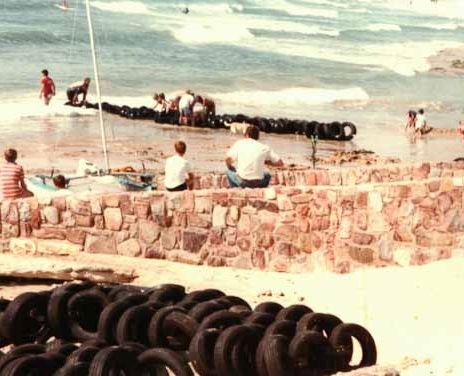 “The municipality then decided [that] they wanted to create a breakwater to try [and] build up the sand a bit and make it safer for the Hobie Cats to launch. So they just went and plonked a whole bunch of concrete blocks without doing any sort of study on its possible impacts beforehand. 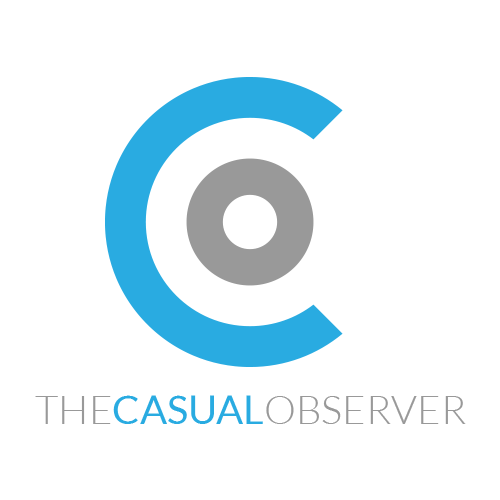 There was plenty of opposition to the eye-sore, and it eventually got removed”. 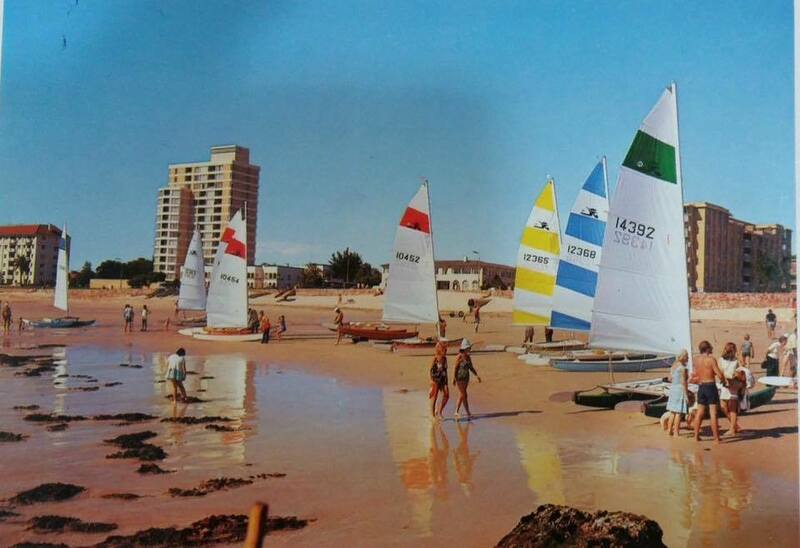 Peter Schwartz recalls that “The Red Windmill was an iconic landmark at Hobie. It was built in the 60’s and was PE’s most famous roadhouse at the time. It had the best soft serves [that] one could imagine. And that little “FLICK YOUR LIGHTS FOR SERVICE” sign on the wall above the menu always had people giggling because the “L” and the “I” in “FLICK” were a bit close together n it looked like “F*CK YOUR LIGHTS FOR SERVICE”! A couple big things occurred in 1984. 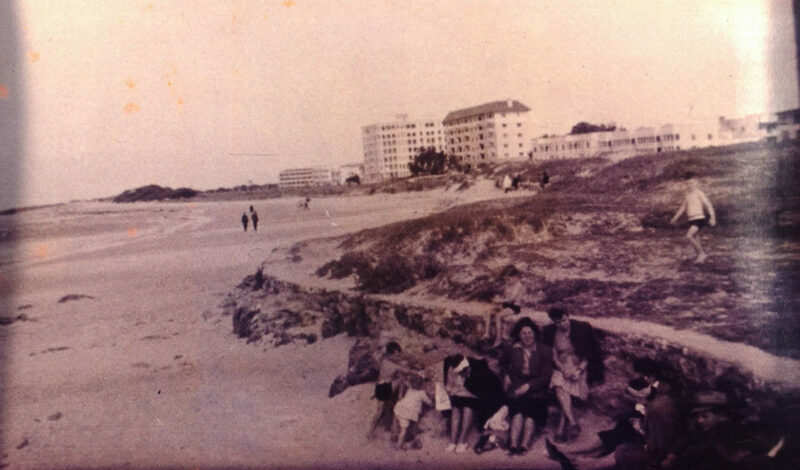 The Hollywood Hotel, a landmark, which was a surfer hangout back in the day, was demolished. It made way for what today is the apartment block No1 Summerstrand on the corner of 1st Ave. In the same year, the Yacht Clubhouse was built next to the Red Windmill, where it still stands today in the carpark at Hobie. 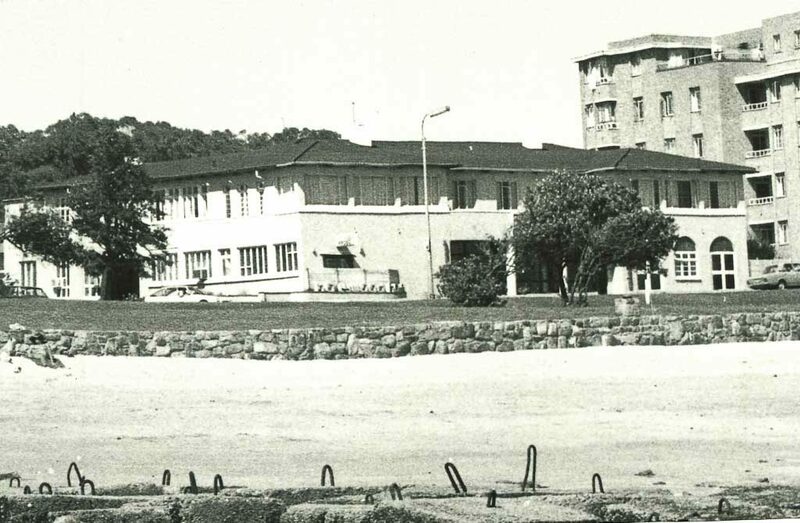 Yet another controversial beachfront saga arose, as no building was meant to take place on the sea side of Marine Drive. The Yacht Club is situated to the far right of the shot. Across the road were a shopping centre and behind it was a caravan park. 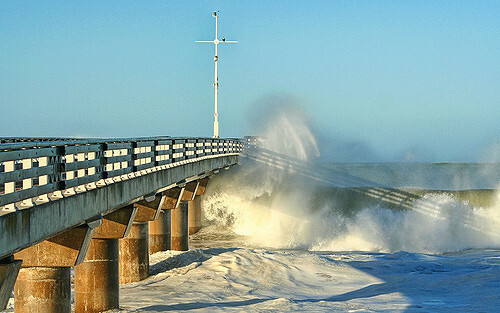 The rock is where the pier extends from today. 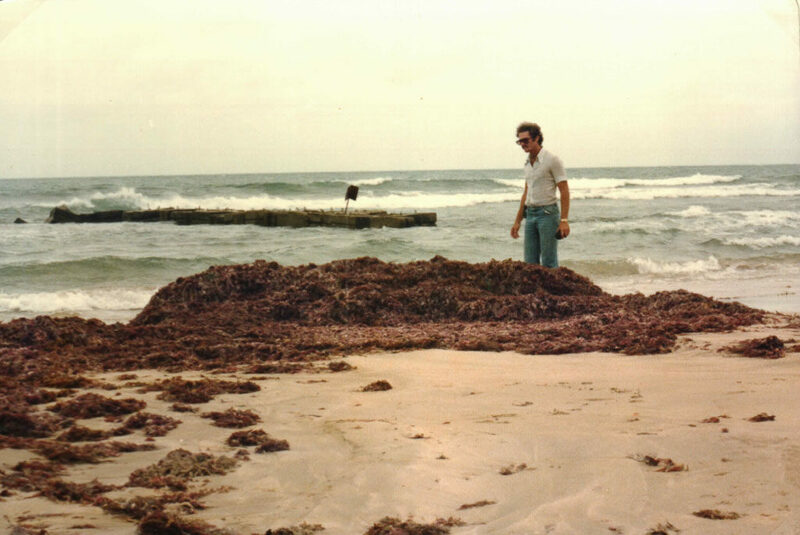 The small reef of rocks to the right is still there today – just buried under the sand. 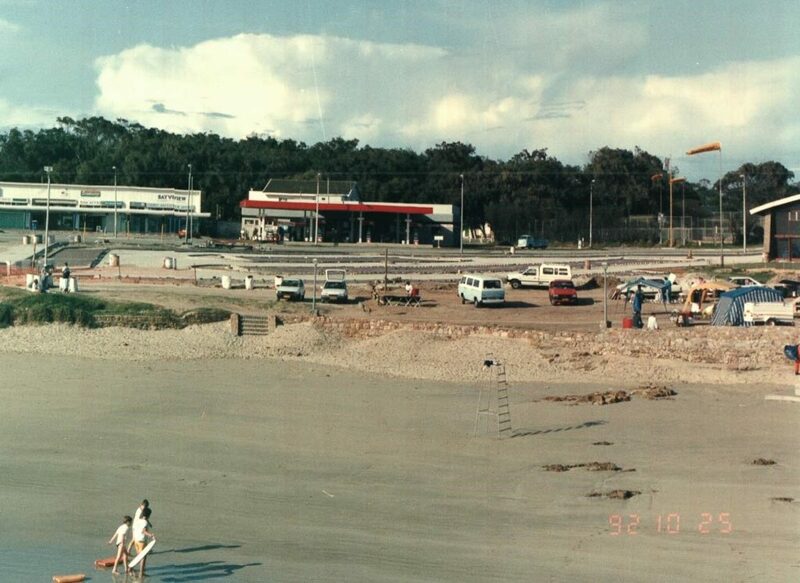 Hobie Beach as we know it today took shape in 1988 with the building of the new car park, walkways and the start of the construction of Shark Rock Pier. The plan for the pier was to capture sand on the beach to cover what had become a really rocky stretch.